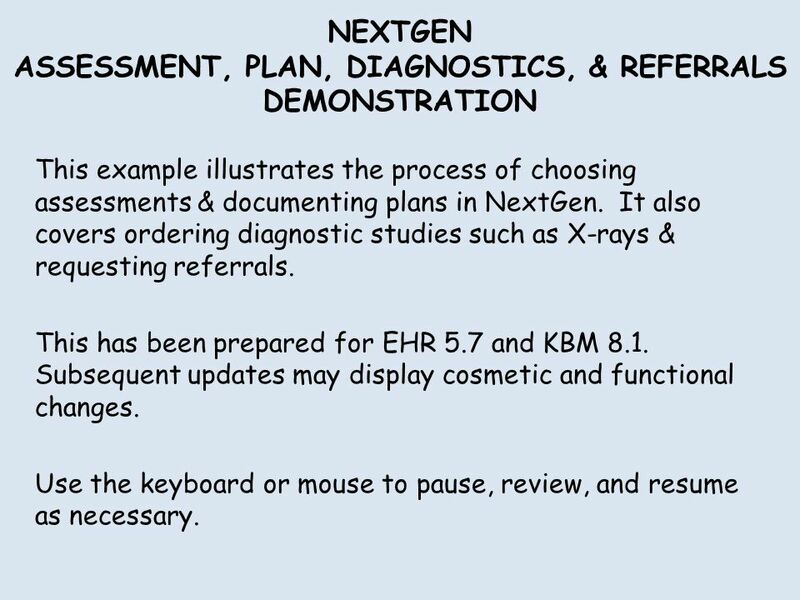 1 NEXTGEN ASSESSMENT, PLAN, DIAGNOSTICS, & REFERRALS DEMONSTRATION This example illustrates the process of choosing assessments & documenting plans in NextGen. It also covers ordering diagnostic studies such as X-rays & requesting referrals. This has been prepared for EHR 5.7 and KBM 8.1. Subsequent updates may display cosmetic and functional changes. Use the keyboard or mouse to pause, review, and resume as necessary. 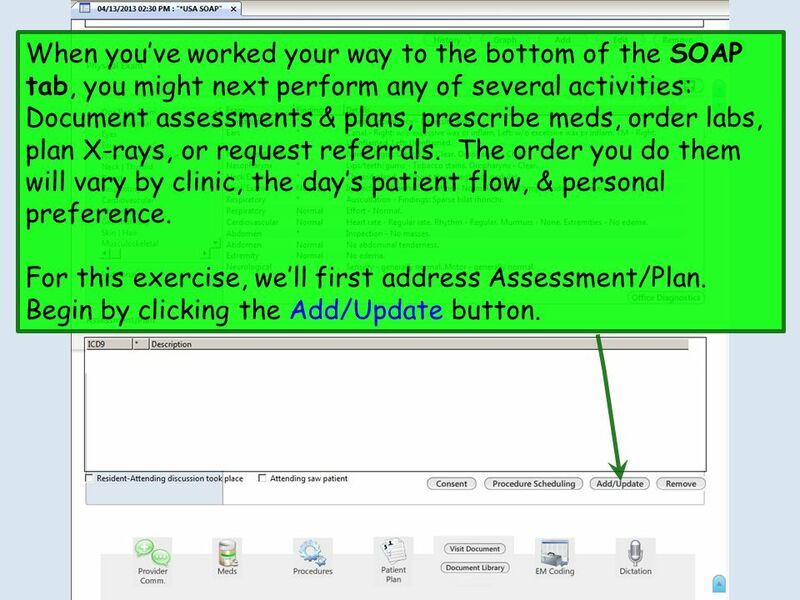 2 When you’ve worked your way to the bottom of the SOAP tab, you might next perform any of several activities: Document assessments & plans, prescribe meds, order labs, plan X-rays, or request referrals. The order you do them will vary by clinic, the day’s patient flow, & personal preference. For this exercise, we’ll first address Assessment/Plan. Begin by clicking the Add/Update button. 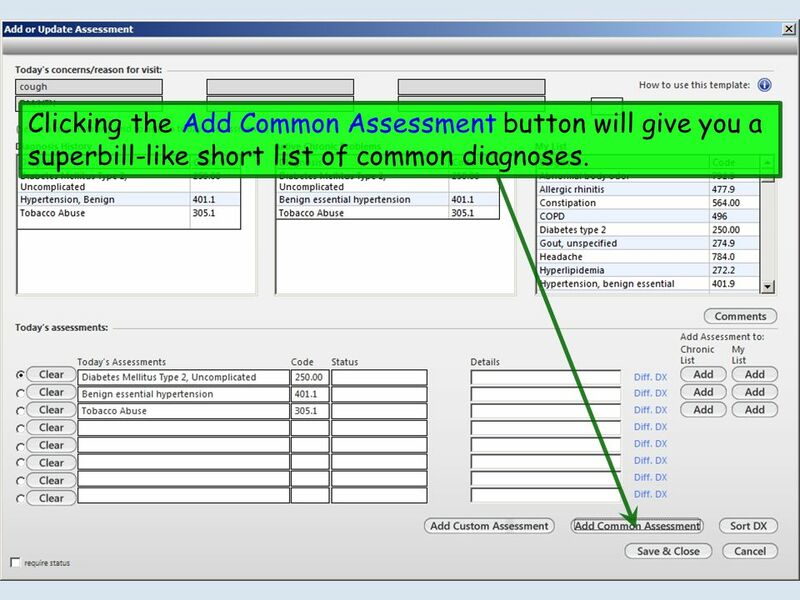 4 Clicking the Add Common Assessment button will give you a superbill-like short list of common diagnoses. 5 Click COPD to add it to Today’s Assessments. 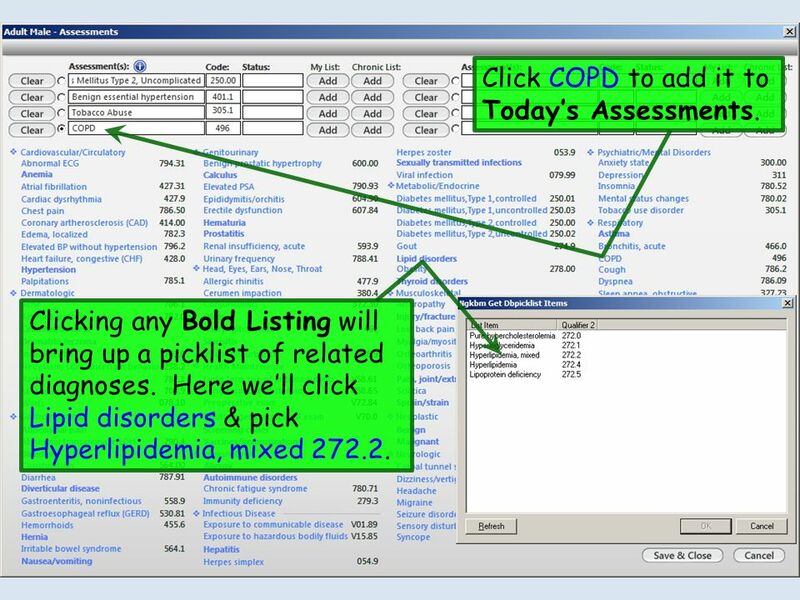 Clicking any Bold Listing will bring up a picklist of related diagnoses. Here we’ll click Lipid disorders & pick Hyperlipidemia, mixed 272.2. 6 When done click Save & Close. 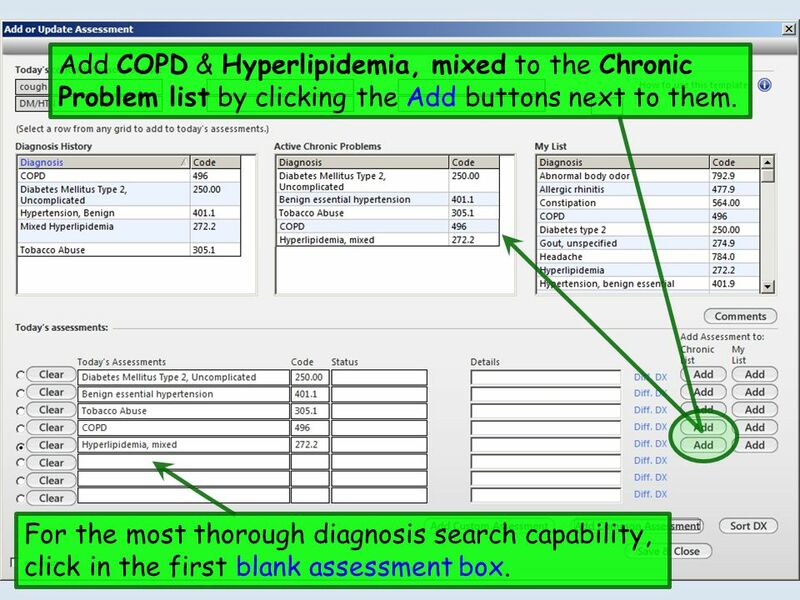 7 Add COPD & Hyperlipidemia, mixed to the Chronic Problem list by clicking the Add buttons next to them. For the most thorough diagnosis search capability, click in the first blank assessment box. 9 Scroll through the results & pick your choice. 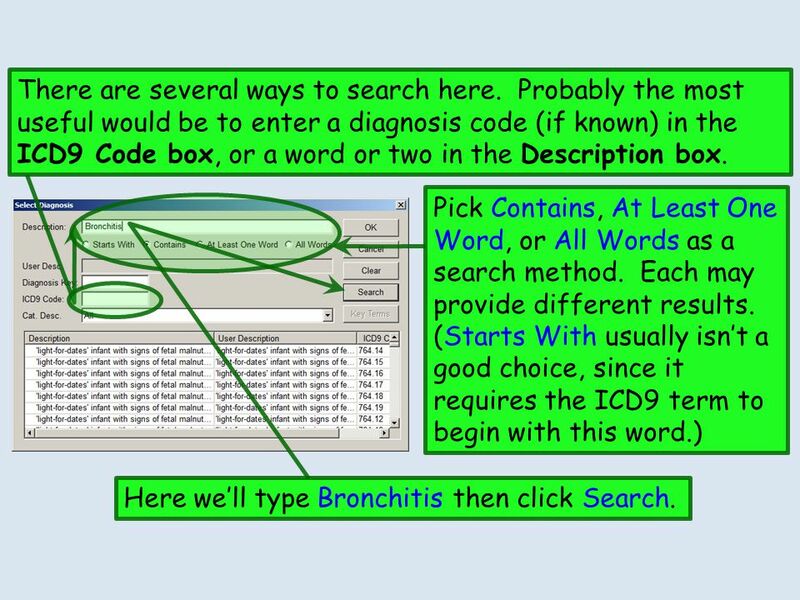 Here we’ll double-click on Acute bronchitis. 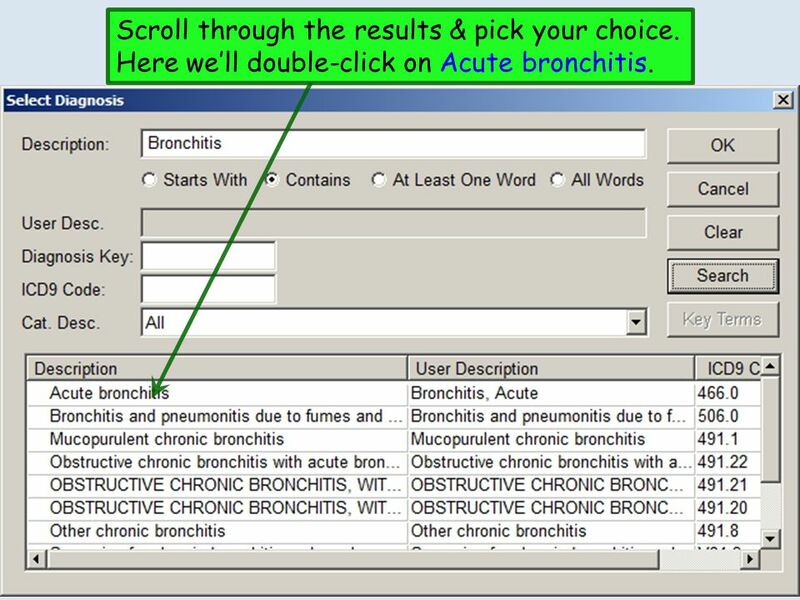 10 Let’s add Bronchitis, Acute to My List by clicking the associated Add button. When done click Save & Close. 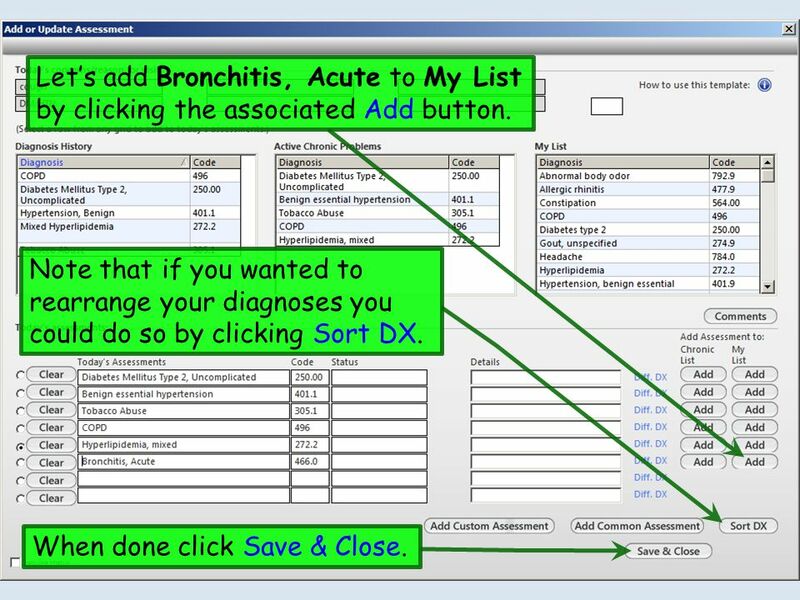 Note that if you wanted to rearrange your diagnoses you could do so by clicking Sort DX. 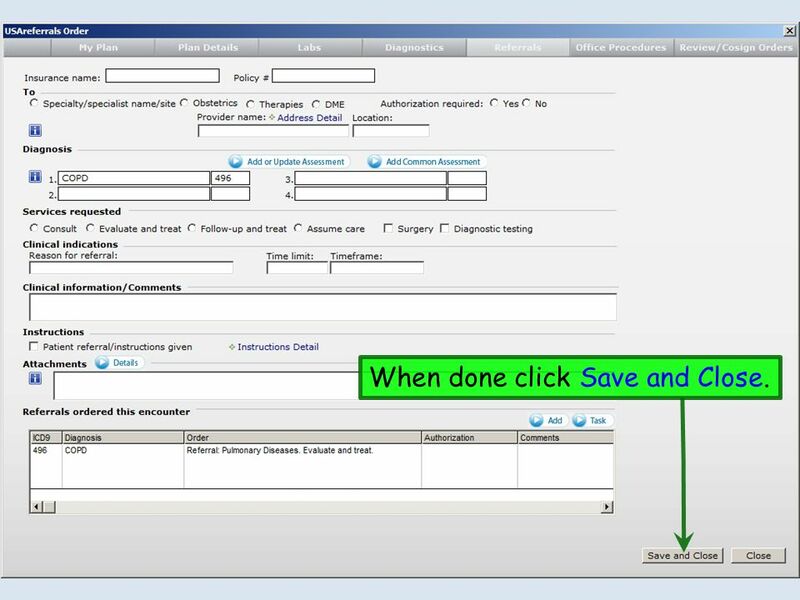 11 Click on the He is to schedule… dropdown arrow, & complete your entries. When done click Place Order. 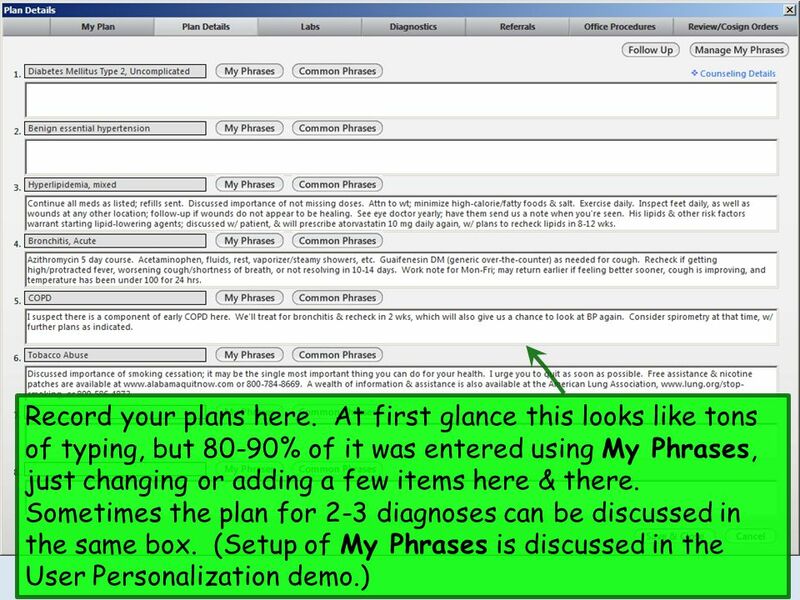 The My Plan Suite opens, initially focused on the My Plan Tab. While there are things you can do here, NextGen has given us mixed messages about the future of this particular template. One thing you might want to do, though, is to indicate follow-up plans. 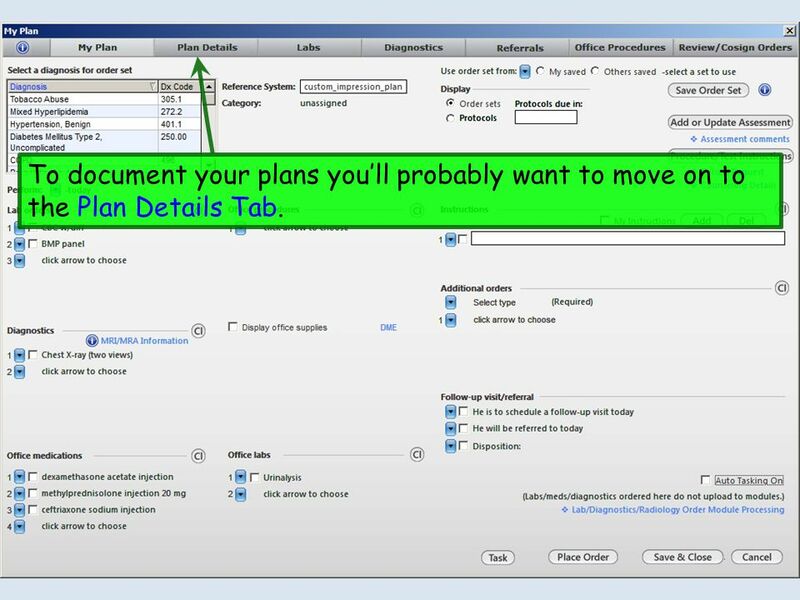 12 To document your plans you’ll probably want to move on to the Plan Details Tab. 14 For this demonstration let’s also order an X-ray. 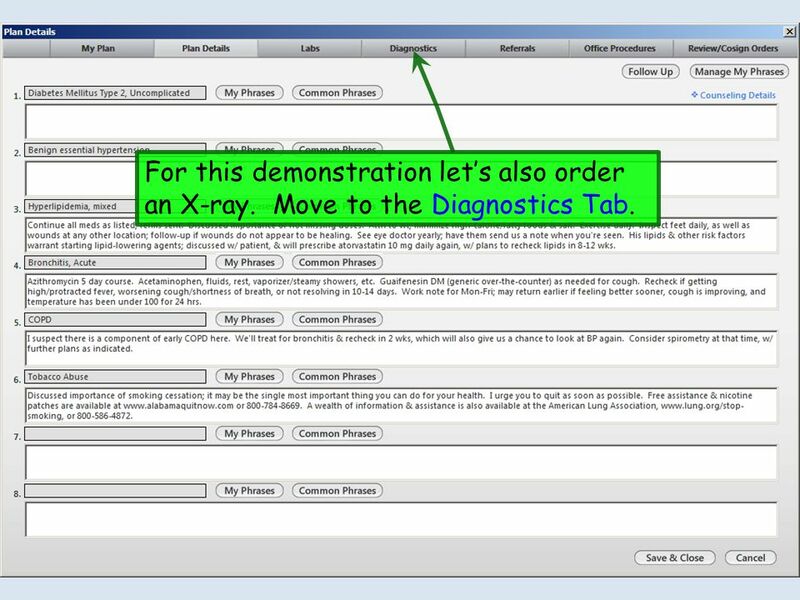 Move to the Diagnostics Tab. 15 We’ll select the COPD diagnosis to associate with the X-ray. 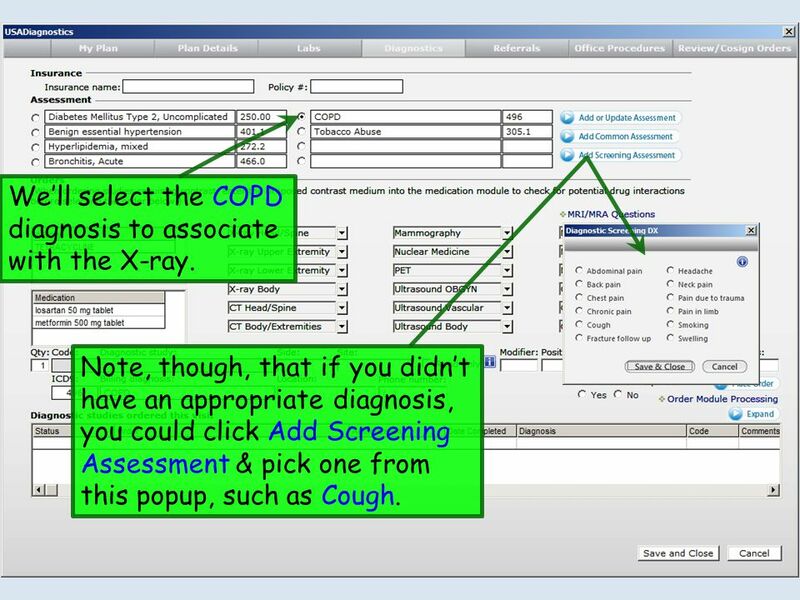 Note, though, that if you didn’t have an appropriate diagnosis, you could click Add Screening Assessment & pick one from this popup, such as Cough. 16 For some films you might need to enter more details, but not for a chest X-ray. 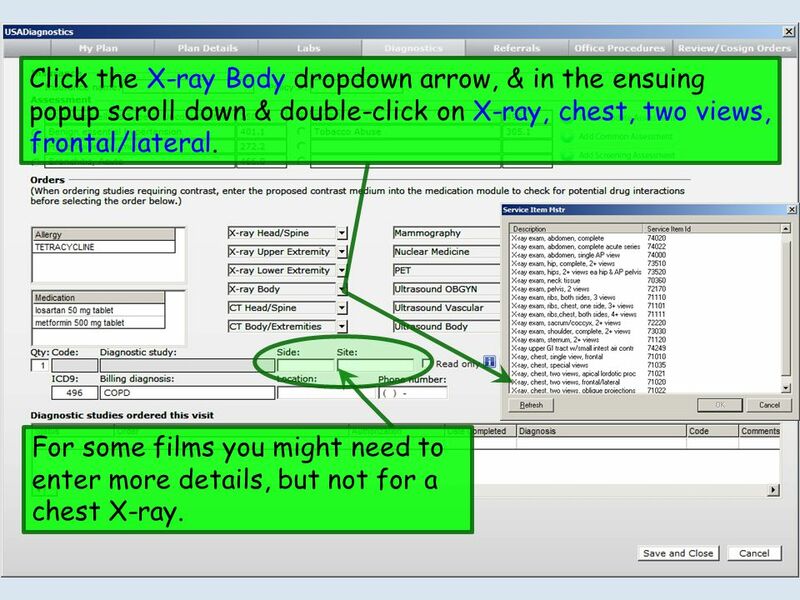 Click the X-ray Body dropdown arrow, & in the ensuing popup scroll down & double-click on X-ray, chest, two views, frontal/lateral. 17 Click Place Order. 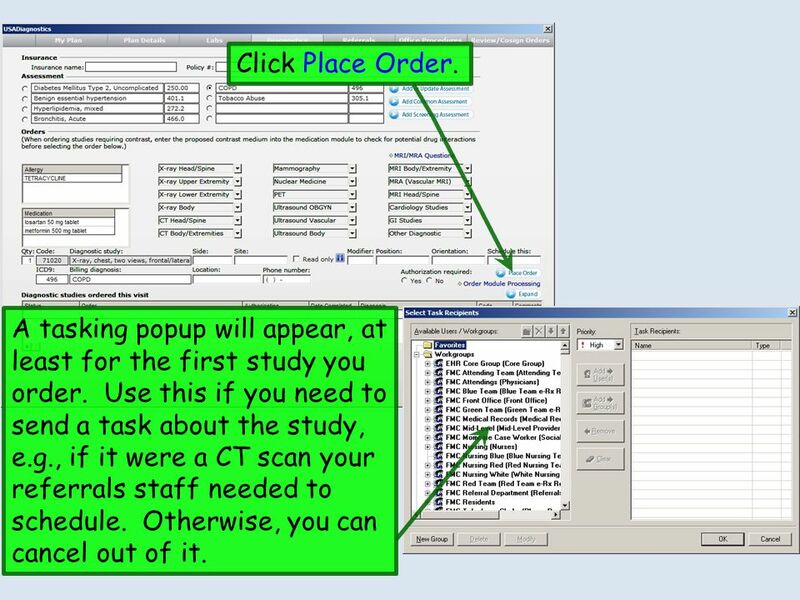 A tasking popup will appear, at least for the first study you order. 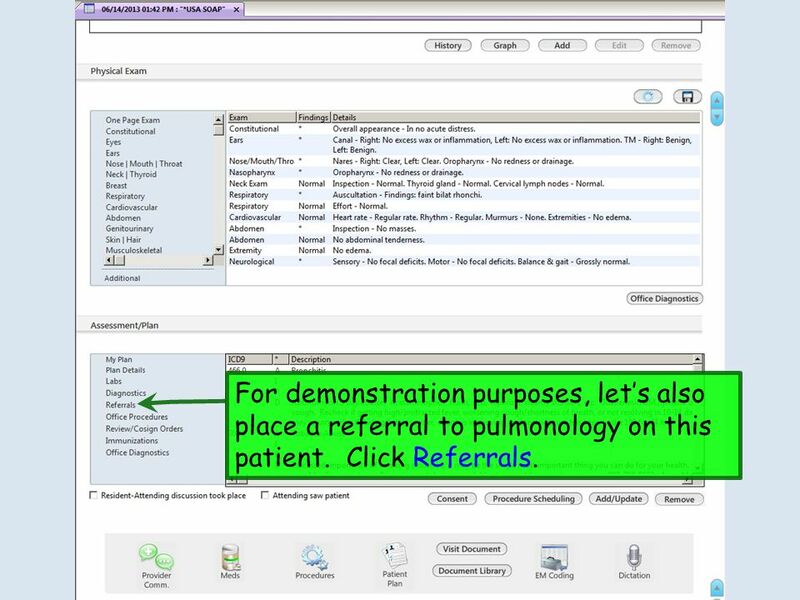 Use this if you need to send a task about the study, e.g., if it were a CT scan your referrals staff needed to schedule. Otherwise, you can cancel out of it. 18 Your order appears on the grid. 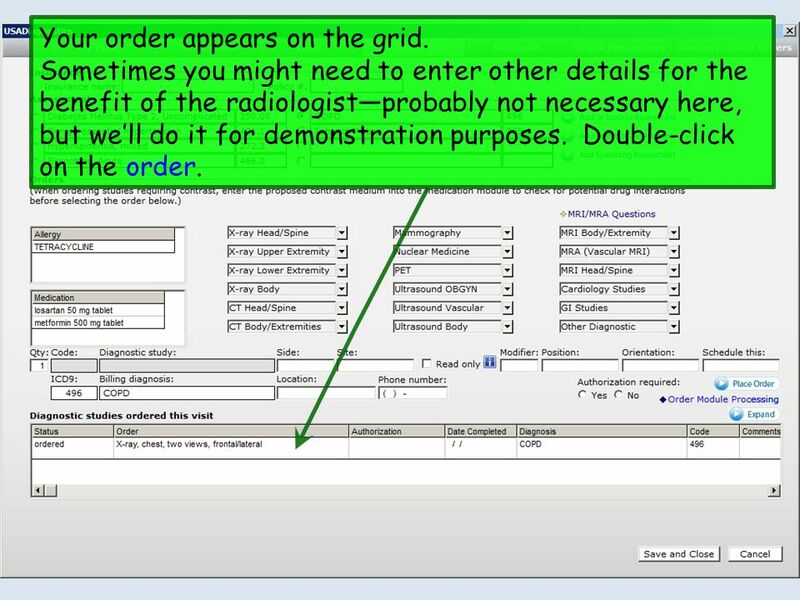 Sometimes you might need to enter other details for the benefit of the radiologist—probably not necessary here, but we’ll do it for demonstration purposes. Double-click on the order. 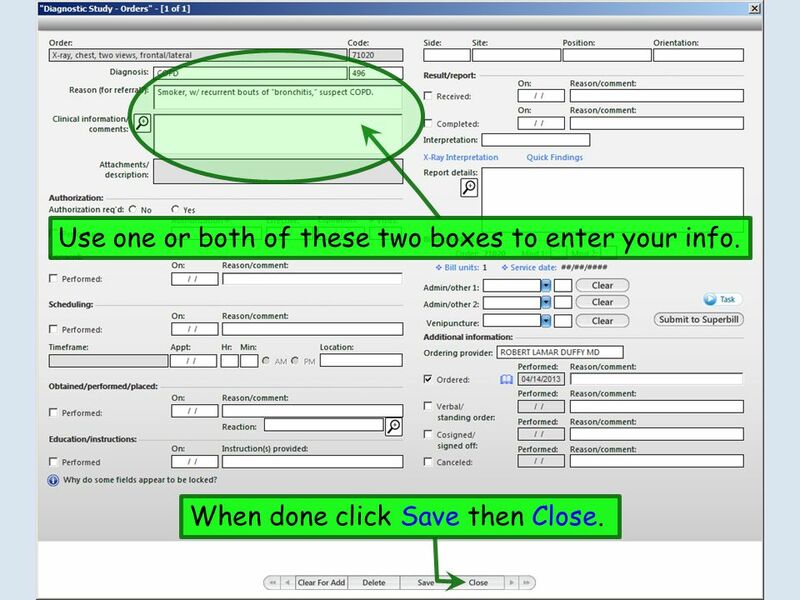 19 Use one or both of these two boxes to enter your info. When done click Save then Close. 20 We’d often want to print an X-ray requisition at this point. 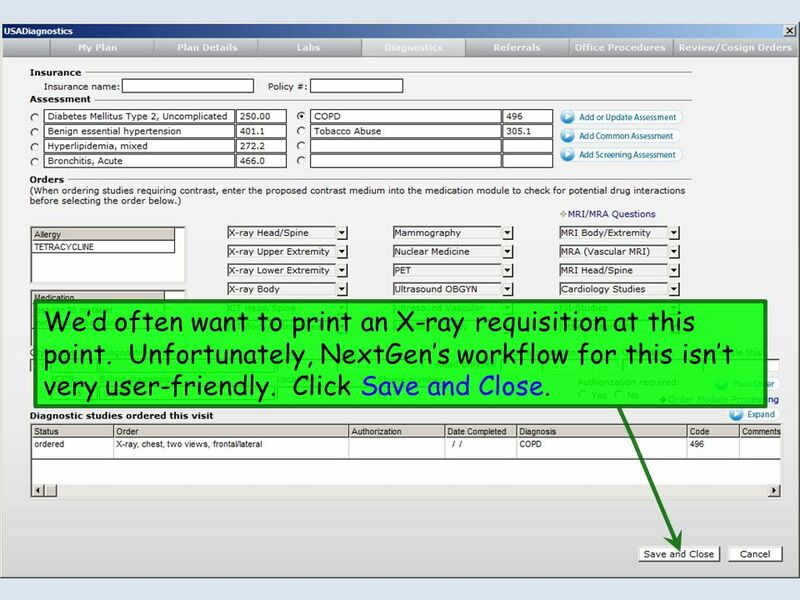 Unfortunately, NextGen’s workflow for this isn’t very user-friendly. 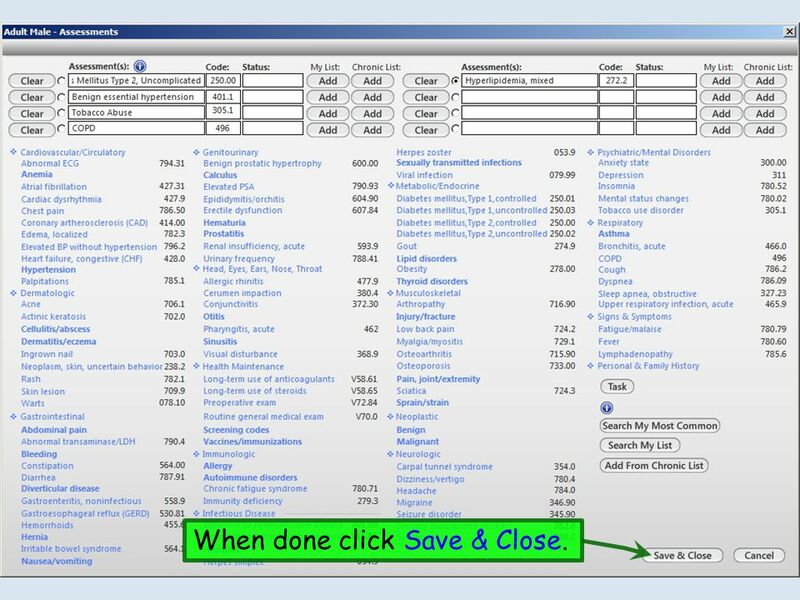 Click Save and Close. 21 Go to the Checkout tab. 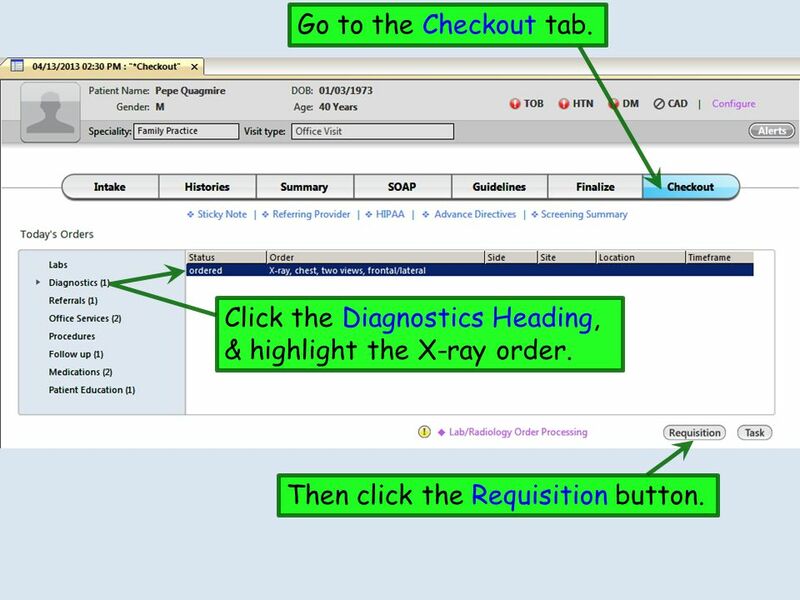 Click the Diagnostics Heading, & highlight the X-ray order. Then click the Requisition button. 22 The requisition generates. Click the Printer icon to print it. 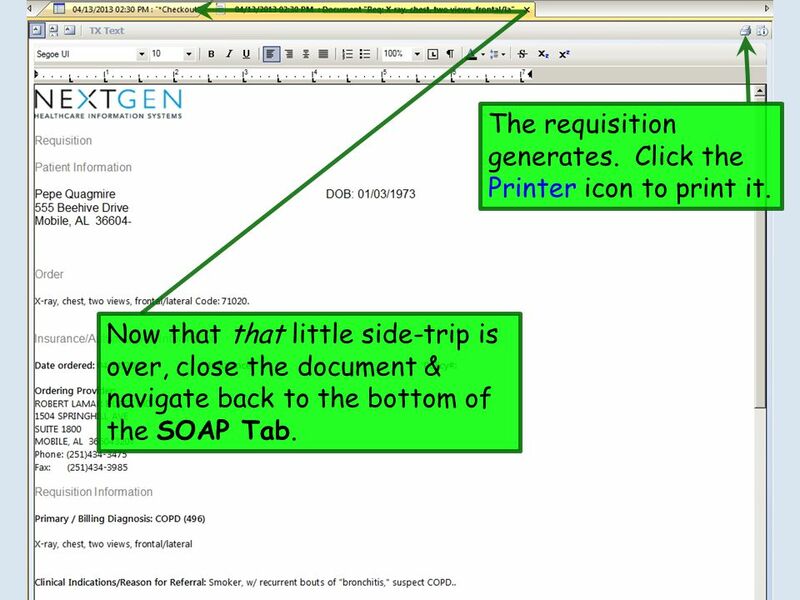 Now that that little side-trip is over, close the document & navigate back to the bottom of the SOAP Tab. 23 For demonstration purposes, let’s also place a referral to pulmonology on this patient. Click Referrals. 24 Navigate to the Referrals Tab. 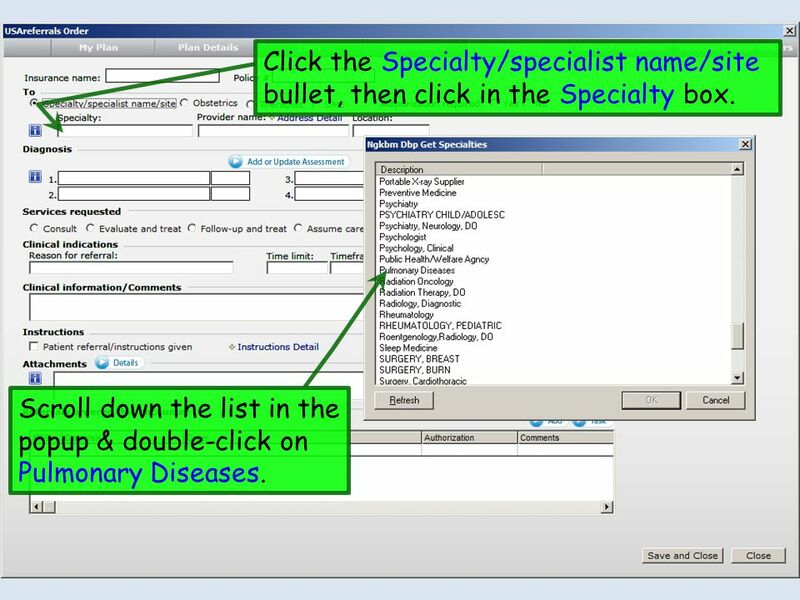 25 Click the Specialty/specialist name/site bullet, then click in the Specialty box. Scroll down the list in the popup & double-click on Pulmonary Diseases. 26 You can add up to 4 diagnoses if necessary. Click the 1st Diagnosis box. You’ll see a list of today’s assessments & the patient’s chronic problems. 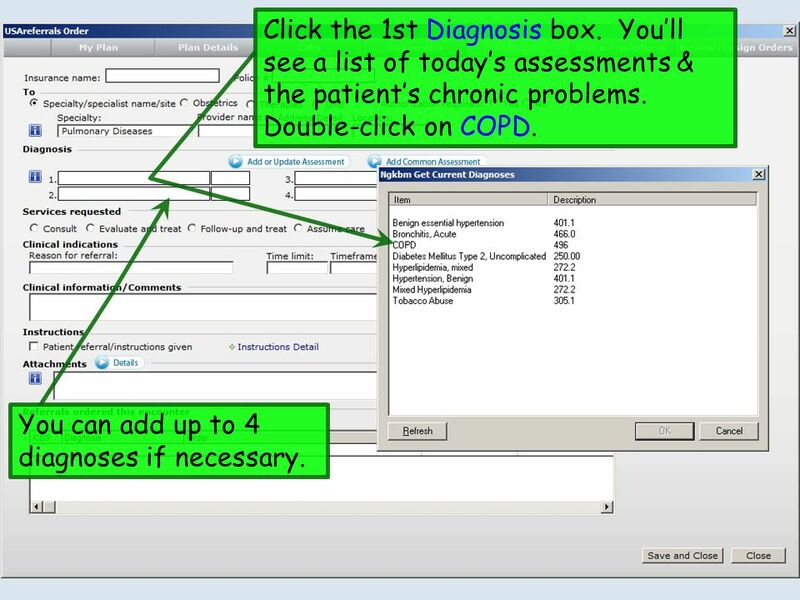 Double-click on COPD. 27 There may be something on the ensuing popup you can use, but most of the time you’ll just close out of it & type something like Smoker with recurrent bouts of bronchitis. Please evaluate & treat further. CXR available in USA system. You could also add info about a specific doctor, such as He requests Dr. Wilms. 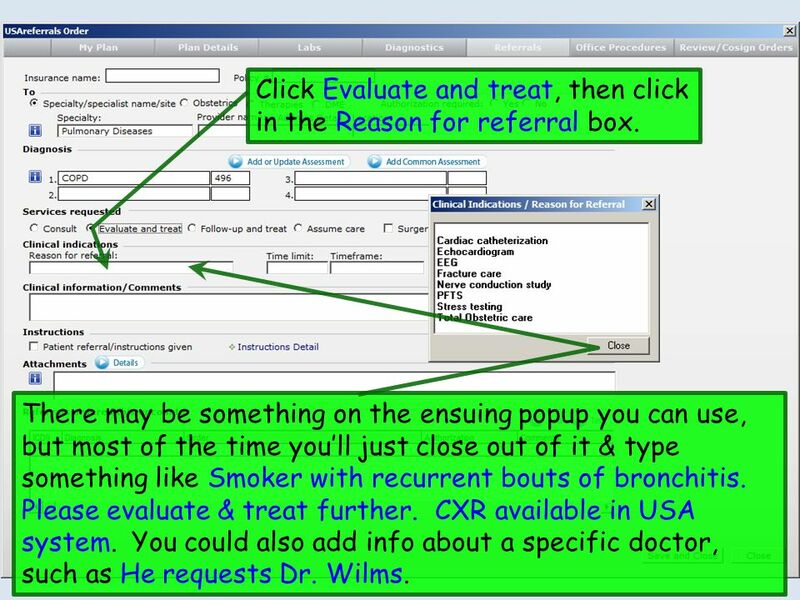 Click Evaluate and treat, then click in the Reason for referral box. 28 Click Add. 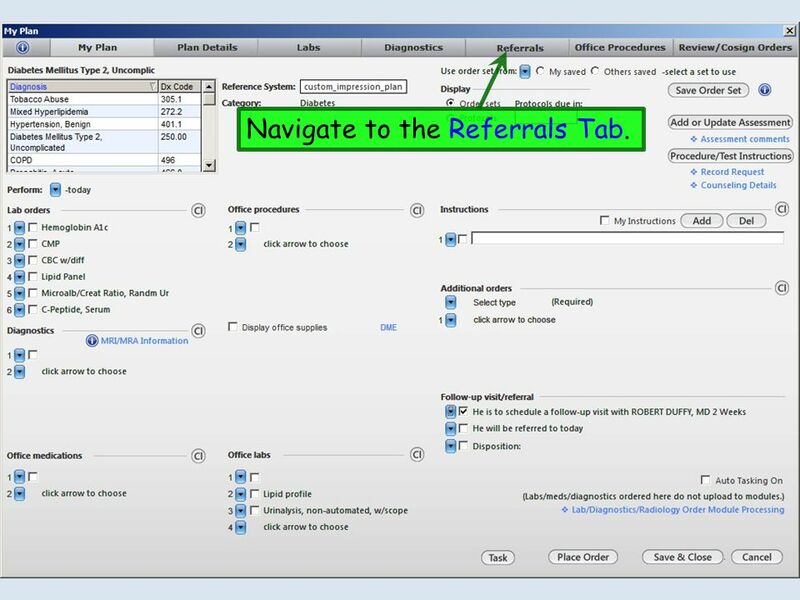 In the ensuing tasking popup, send a task to your referrals staff. 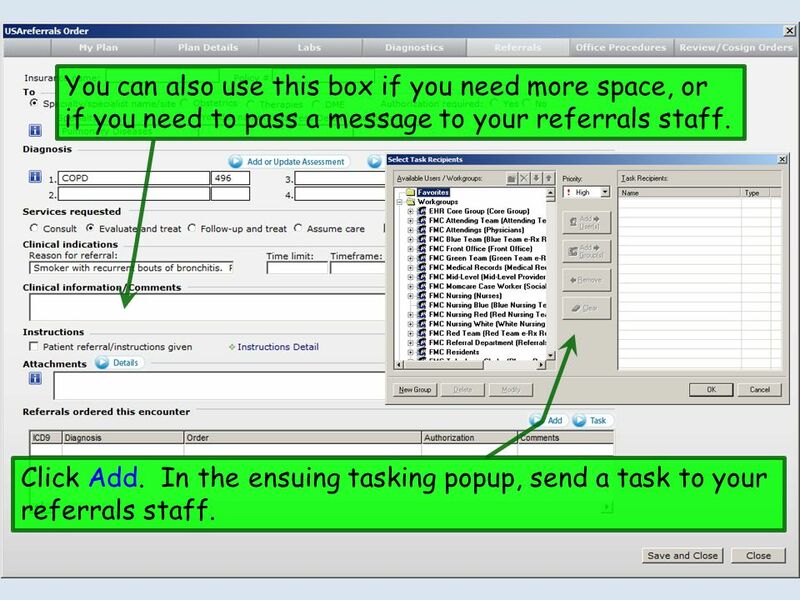 You can also use this box if you need more space, or if you need to pass a message to your referrals staff. 29 When done click Save and Close. 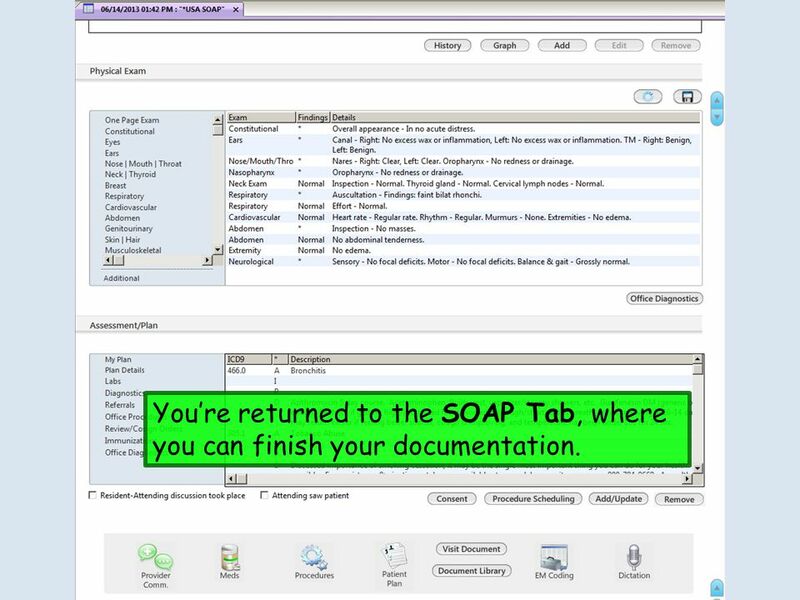 30 You’re returned to the SOAP Tab, where you can finish your documentation. 32 R. Lamar Duffy, M.D. 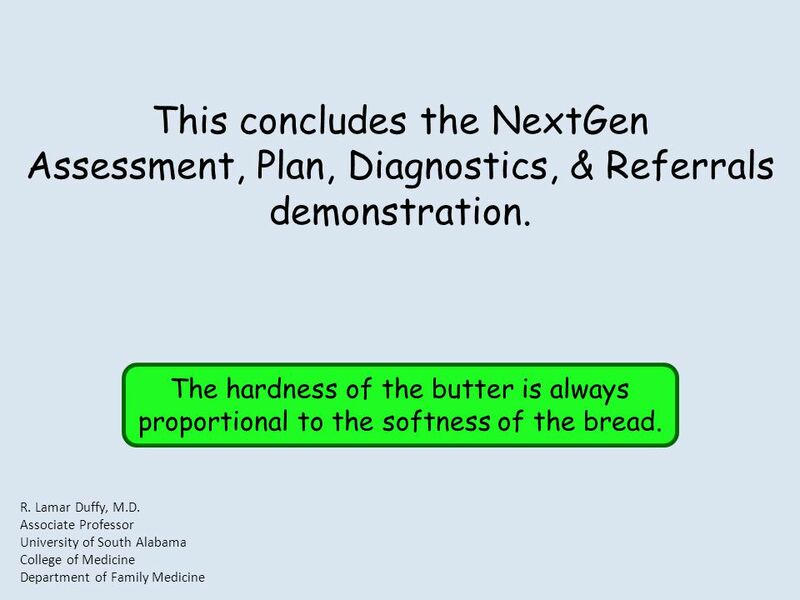 Associate Professor University of South Alabama College of Medicine Department of Family Medicine This concludes the NextGen Assessment, Plan, Diagnostics, & Referrals demonstration. The hardness of the butter is always proportional to the softness of the bread. 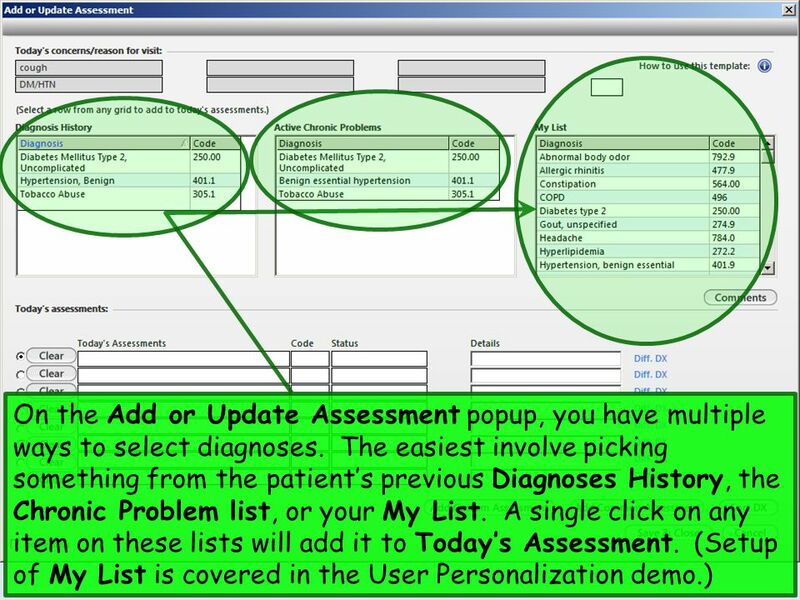 Download ppt "NEXTGEN ASSESSMENT, PLAN, DIAGNOSTICS, & REFERRALS DEMONSTRATION This example illustrates the process of choosing assessments & documenting plans in NextGen." 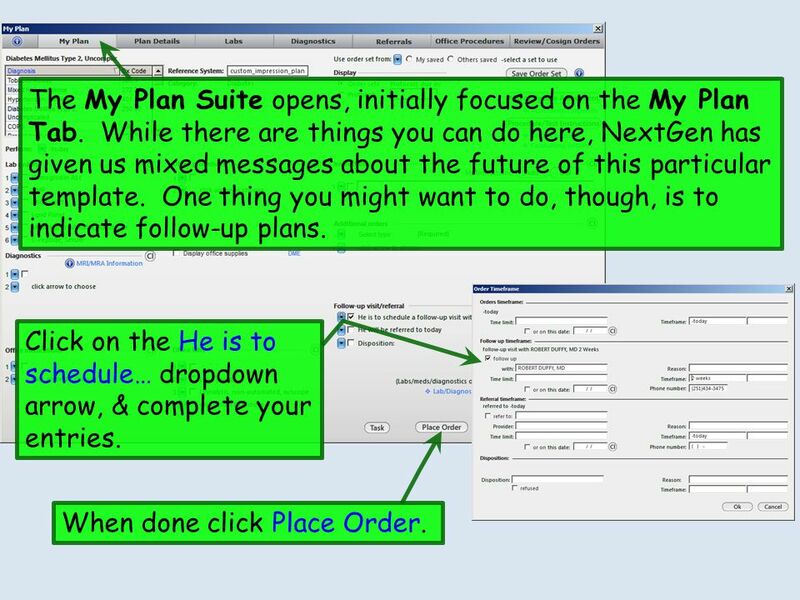 NEXTGEN MY PLAN LESSON Update: October 2012 This lesson introduces the use of My Plan, which heretofore has been largely dysfunctional due to technical. NEXTGEN IMAGE MODULE DEMONSTRATION This demonstration illustrates some of the ways in which you can use graphic images in NextGen. This has been prepared.